If you offered someone a time machine, most would take it. The ability to see what’s ahead and affect what’s behind is amazing. We’ve already seen plenty of movies depict what’s possible, “Back to the Future” being the most famous. 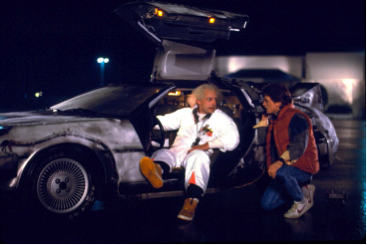 It’s a story where Marty McFly and his friend Doc Brown modify a stainless steel DeLorean into a Time Machine. When it hits 88 mph, they can go anywhere in time. Marty’s first adventure was an accident. He goes back in time, to the decade and location where he already knows the story of how his parents met and the lightening strike in town, etc. He has a clear idea of what and when events will happen because someone in his current future (parents) already told him. He uses this information to guide, survive and ultimately return himself (with the help of Doc) to the point in time where he made his first time jump. Later in the story, he goes forward in time. No one can foretell him what the future looks like, so he has no idea what to do. He knows the past, but learns about his future as he’s experiencing it. His most important lesson about this future is he learns his present day decisions have a huge effect on it. With this information, and an image of his future he goes back in time to the present and chooses to make changes that will provide a better future for him and his family. His ability to have a forecast or image of what his current future looks like is a game changer for him. He makes different decisions in the present because he can foresee what will happen in the future. 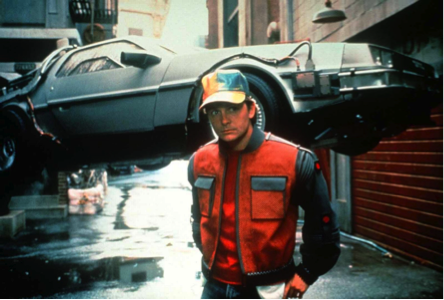 Today, we work with a lot of clients, who in a way are like Marty McFly – they need a time machine. They can tell me what they need to do in the next 2-4 weeks, because they have a way to anticipate things and drive their future– new campaign planning, reports due, important meetings, budget planning, deliverables, upcoming vacations, trips, baseball tourneys and so on. Sure unexpected things happen, but in general they know about 75% of what’s ahead. The ability to have an idea of what’s ahead helps them plan what they should be doing today to achieve the outcome they want. What’s interesting is, when we talk about their business or more specifically their future revenue or conversions — they have little to no idea, it’s only a guess or hunch. They’re not alone. Every year billions of dollars are spent with little to no idea what the outcome will be. I’m not talking about the billions of dollars waged in Vegas, I’m talking about the billions of dollars spent on advertising, ecommerce, product introductions, etc. There’s no accurate forecast for what these dollars will achieve, because no organization has a strong grasp on what the people who are currently engaging their brand may do next. It’s not about “real-time data” or even “big data.” It’s about knowing who’s in your store, where they are in the buying process and confidently anticipating what they will do next allows you to have peace of mind and the ability to foresee if and when they will do the outcome you are hoping for (buying a product, filling out a form, etc.). Almost all of the dollars spent online are spent with little ability to foresee what may happen. Spending is commonly a best guess. I should know, I’ve managed ad budgets, allocations and products. Sure I always had a desired outcome, but I commonly, like most people, spent with a best guess. We spend…we wait…then we experience the results (surprises or disappointments) – it’s a fine line between craziness, art and science. The sad part, we’ve been doing this for years. Even with all the new tools and solutions (which most tell us what happened vs. what I should do to achieve my desired outcome), our conversion and engagements rates have remained flat, while the dollars we spend have been increasing year over year. We can’t see or anticipate the road ahead. We need a better way to foresee or forecast what people, who are actively engaged with our brand may do. For Convertant, one of our drivers is to give customers a clearer picture of what the next 30-days looks like in terms of revenue, conversions, product interest and what people engaged with their brand may do. We assemble and process current brand engagement data to make this determination. It’s a complex process, but we make it simple. This is important because when you can foresee, with a level of confidence, what may happen and you can better design plans, spending and product introductions for the desired outcome you want. We simply want to give you a picture of what’s happening today and what you should do about it tomorrow. So the next time you want to jump in a time machine and go to the future, make sure to bring Convertant along for the ride, there’s a very good chance our prediction of what you will experience, you will actually experience.